The Wendy’s job application is the required form that must be submitted in order to apply for a (restaurant) position with Wendy’s. 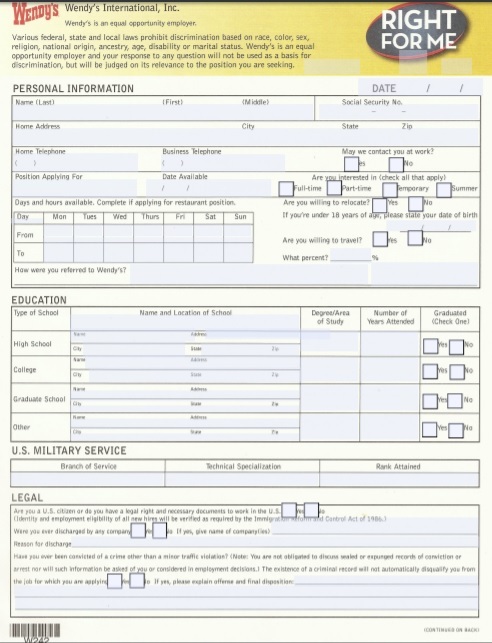 The form can be filled out online, or downloaded and then printed out. Some of the positions that can be applied for using the application include crew member, shift manager (supervisor), general manager, etc. Apply online to search for multiple job openings in your area. Step 1 – Visit the Wendy’s careers site (https://careers.wendys.com/). Step 2 – Search for jobs by filling out the form on the left side of the page (click the “Search” button to load the results). Step 3 – Review the results, and then click the “Apply” button of the job you’re interested in applying for. Step 4 – At this point in the application process you will be redirected to the independent franchisee’s online application form. Each franchise has a different online process. Step 5 – Fill in all of the required sections of the application. After it has been completed, e member of the management team will contact you regarding your application.